Mary is doing a variety of interesting things. She came to dietetics later in life and now works with both individuals and reaches a large audience via her show and podcasts. She's a great example of how dietitians turn research into practical advice. Like Mary, I jumped right into the private practice world, having never had a traditional job. I love the thought that went into her responses and am excited to read her book (since she kindly sent me a copy)! I have always been interested in food, health and nutrition since I was a little girl. I originally chose to become an actor but never lost my passion and zeal for broccoli and pomegranates. I started questioning this career choice in my early 30’s just as my dad was diagnosed with a very serious disease that wound him in a hospital where he received some very questionable advice from the dietitian there. 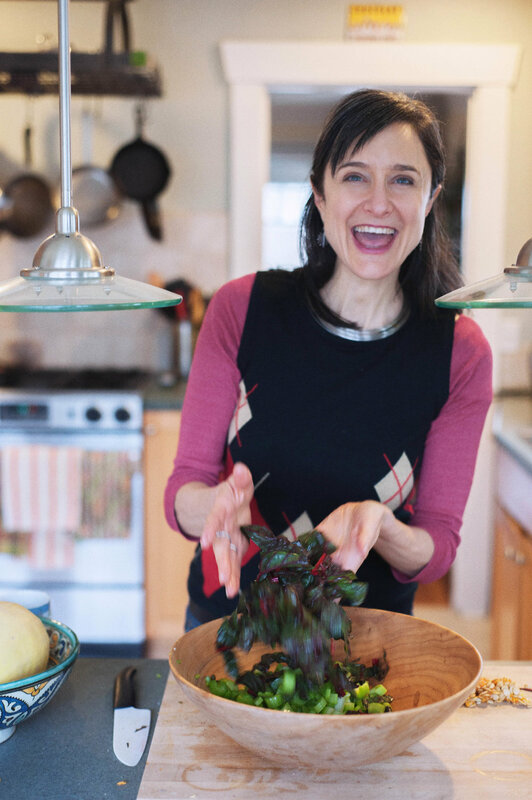 When I began to realize that food actually had the power to help prevent and address disease I knew that I had to switch gears and do whatever I could to help people who may be in need of nutritional guidance. I was determined to heal the world one meal at a time! I work at the start up scientific wellness company called Arivale in Seattle, as a Registered Dietitian Coach and Clinical Education Lead. I also host a web series and podcast called “Mary’s Nutrition Show” with my husband, who is a videographer and lead producer, all around great guy and fellow broccoli enthusiast. Because Arivale is a start up culture, every day is incredibly different. I spend a lot of time reaching out to and speaking to, texting or emailing my clients keeping them accountable as well as inspired and encouraged, and fielding questions from them on a regular basis. I hold clinical office hours where other RDN’s can pick my brain about tough cases. I attend trainings about new data, go to meetings about company updates, group gatherings around both clinical or personal topics, drink copious amounts of tea and have brief chats with other RDN’s in our kitchen area, and read a lot of research. For Mary’s Nutrition Show, I brainstorm show ideas, stay current on social media, practice talking points, respond to comments and queries and go to the grocery store often where I can try new products that I can be confident recommending to my listeners. After attaining my graduate degree in nutrition and finishing my internship at Bastyr University, I decided it would be a good idea to hang my shingle and go into private practice, even with no real business experience. (I don’t recommend this!) I had never had a normal job, so the thought of a 9-5 gig was very unappealing. The internship schedule almost killed me. I wanted autonomy. I started off in what might be thought of as a utility closet at a gym and gradually worked my way to an office with windows and a couch. I also got a part time job for two years as an outpatient dietitian at a hospital in Seattle which filled in the gaps very nicely. I also started providing wellness presentations at local businesses and community centers and began to build my brand as a private practice dietitian. I am definitely a life long learner who for the past 10 years has listened to dozens of professional webinars and attended several different major conferences and symposiums every year that mostly focus on functional and integrative approaches to health. I took the Functional Nutrition Course through the Institute for Functional Medicine, and the Food as Medicine professional training courses through the Center for Mind-Body Medicine. Being on the executive committee and now the Chair of Dietitians in Integrative and Functional Medicine has also afforded me numerous opportunities to build my knowledge base. I will never stop pursuing learning opportunities especially when the field is so incredibly dynamic. I just hope my brain can hold all the info! I hope the world of dietetics will be more aligned and less divided on a variety of topics. Or if the division still exists, I hope there is a cordial agreement to respect the others’ opinions. I also hope food policy won’t be so driven by food industry. I fear that decisions around our food – both access and quality – are often being made by organizations that may not always have the consumer’s health in mind. I would love for RDN’s to have greater respect overall in the medical community as an integral part of the health care picture. I also hope that more RDN’s feel empowered to take an integrative approach to nutritional counseling, incorporating other aspects of what constitutes “health” and come to understand the value of personalizing the strategies, and that not all research may apply to every single person in the same way. And I hope that this is taught and incorporated into nutrition school curriculums and in medical schools. Filling out the conversation with our patients to include sleep, stress, GI (gastrointestinal) issues, environment, genetics, physical activity, and the benefits or lack thereof of supplementation will inevitably make our ability to guide and improve health outcomes all the stronger. I don’t think people, my friends and acquaintances included, or other medical professionals always understand the depth of our knowledge and training around food and disease and how strong our understanding is of how to prevent, treat and in some cases possibly even reverse chronic health issues. I think some believe that I sit there and tell people to stop eating fast food and eat more vegetables so they can lose weight. I don’t think they understand that food is information for our genes and helps to support our bodies’ biochemical functions, and that decisions around meals go way beyond calories in and calories out. I am extraordinarily passionate about the potential that a food as medicine approach has in stopping chronic disease. I love the idea of thinking outside the box with strategies, with trialing options with patients and considering n=1 experiments as a way to determine if the intervention is right for that individual. When we start focusing on the root cause of disease and begin our guidance from that perspective, we have the ability to dig deep and understand how to get us out of the health crisis in which we have found ourselves. Do I have to have a favorite? It depends on the season, on my mood, where I am, but I do love a good Spicy Indian or Thai veggie curry over brown rice, or vegetarian chili bursting with veggies and a side of corn bread. But then I also go nuts for a massaged kale salad with avocado and walnuts and beets! Give me flavor, richness, spice and color. Can I have that many favorites?? Don’t NOT do something because you are scared or worried that you won’t be successful. Don’t stay too long doing something in the field that doesn’t fill your soul. Stay open minded about the possibilities of this field and keep up the dialogue with those who may have different philosophies from yours. This is a great way to learn.